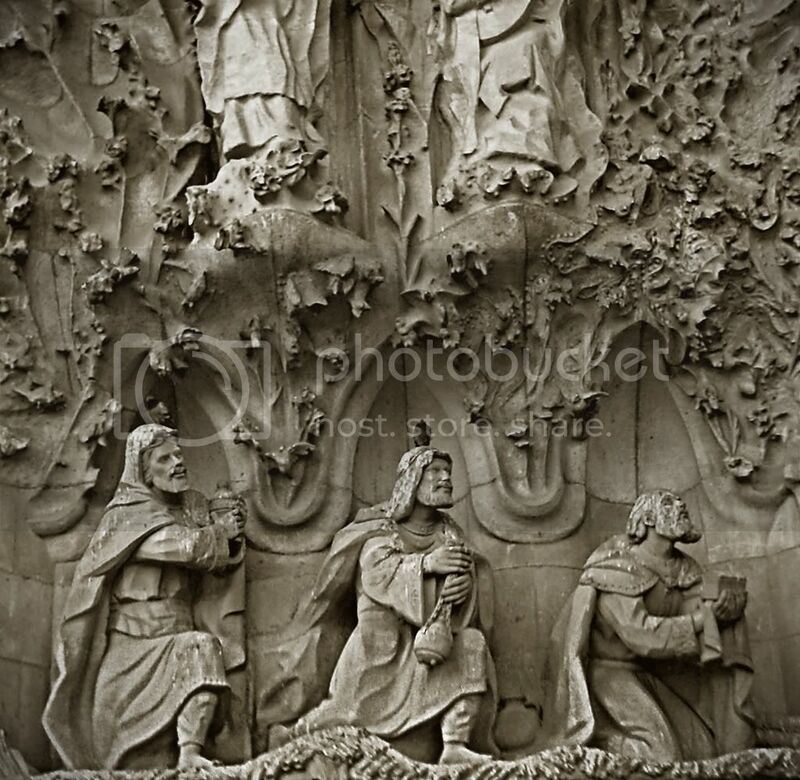 Gold, Incense and Myrrh in the Hands of Gaudi's Three Wise Men. A magic moment immortalized by the craftsmanship of this master of architecture. Notice how the figures seem to be carved out of the very stone and the capricious pleiade of ribbon-like protuberances or adornments on the cathedral's walls. The Nativity Façade or Nativity Portal has been covered in previous posts, so feel free to browse or search for Sagrada Familia or Gaudi in my photoblog. I have used Photoshop in this picture, specifically Fred Miranda's fantastic BW Workflow Pro plugin. um..I even dont know how to write down my comments.I am not from the english culture. So, thx, let me see the beautiful photos, and let me understand more western culture, those religion knowledge. best time to read ur photo blog! my eyes are feasting at the details..impressive work! the expression of the man are fantastic! Have a nice weekend Carlos! That is a wonderful piece of craftmanship and the birds perched on the heads of the two figures to the left add a nice touch. Your photo is well exposed and also framed nicely.